Napa versus Bordeaux – Where do we stand? In 2004 I decided to try an experiment… While I could not duplicate the exact wines from the now famous Judgment in Paris tasting of 1976, I thought matching up some of the best Cabernet Sauvignon-based wines from Napa Valley and those of Bordeaux would be a fun, competitive way to spend an afternoon. Seven years and four tastings later, I have a veritable wine-bath on my hands. I thought it would be fun to look over the four tastings and see how things are fairing. On to the main courses: Gnocchi di Ricotta [TOSCANA] hand crafted “pillows” of ricotta cheese – tomato sauce – pecorino $9.95 / $14.95, Vitello alla Saltimbocca [LAZIO] veal cutlet – Prosciutto di Parma – sage – white wine – polenta – spinach $20.95 and Vitello alla Marsala [SICILIA] veal cutlet – prosciutto – mushrooms – Marsala wine – buttered linguine $20.95. The Gnocchi was heavenly – truly “pillows” of ricotta that melted in your mouth. The saltimbocca was great with a pleasantly biting sauce – the polenta was perfect, having a creamy richness and buttery, nutty flavor. One diner suggested taking a gallon or two home for later enjoyment… The Marsala was good, although I prefer mine a trifle creamier and served traditionally with the pasta on the side, as opposed to mixed together ala ragout. Overall, the food was excellent, albeit as noted, the portions were on the smaller side. We had two wines with dinner: 2009 Planeta, Cerasuolo di Vittoria DOCG $45 (60% Nero d’Avola, 40% Frappato) and the 2009 Tomaresca Neprica, Puglia $32 (40% Negroamaro, 30% Primitivo, 30% Cabernet Sauvignon) – both wines were very nice, the Planeta was the splashier, fruitier of the two, with the Tomaresca having more structure and dark fruit overtones. Prices were fair, hovering between 2-1/2 to 3 times retail. Dessert brought a trio of sweet treats: Cannoli, Tiramisú and Budino. The cannoli was freshly-filled with a crisp shell, but the filling was lack-luster and tasted more like whipped cream than creamy ricotta. The tiramisú was good, although a bit sweet and lacking the strong espresso bite that we prefer. The budino, or traditional Italian bread pudding, was the best of the trio, showing sumptuous, creamy layers that melted in your mouth. Dessert was enjoined by something rarely found, a flight of three Italian Amari, or bitter digestifs. The overall after-dinner drink list was appreciably dizzying – much welcomed as this aspect of restaurant wine lists is often lacking in depth… Commendable and delicious! We had the Nonino, the Lucano and the Ramazzotti, none of which I had tried previously and all of which sang the praises of Amari. Would we return to BonCaldo? Definitely YES! The few noted shortcomings were not enough to offset the overall quality of the food – the Wine Spectator Award-Winning wine list was fairly priced and as previously mentioned the digestifs were simply amazing. According to Ted Haigh in Vintage Spirits and Forgotten Cocktails, the Boulevardier was a Prohibition-era cocktail invented at Harry’s Bar in Paris, circa 1927. 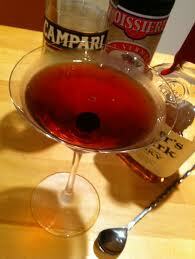 The drink is in essence a Negroni, substituting Bourbon for Gin, but with much more of a punch. I actually prefer Rye, which makes a smoother libation. Lascaux is the site of some of the oldest and best preserved Paleolithic cave paintings, dating back over 17,300 years. In my History of France in Ten Glasses class, Lascaux is where it all starts and we usually serve up something from Côteaux du Languedoc, or sometimes Provence. The caves contain well over 2,000 figures, which have been categorized as animal, human and abstract runic signs. The animals represent large species that have been identified primarily from fossilized remains. The site is a fascinating look into our ancestry and the incredible poise that these ancient peoples possessed. 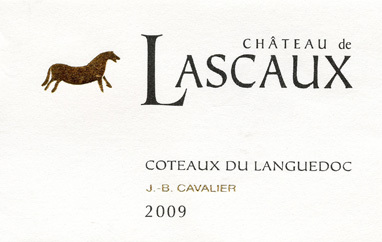 A little while back I wrote about “one that got away…,” referring to a 2007 Château de Lascaux that was simply joyous. Well, in working through the last group of wines reconstructing the Harvard Faculty Club list, I tasted the 2009 vintage from this producer. Like most of what I’ve tasted from 2009, the wine was chock-full of fruit. Where the 2007 had presence, structure and focus, the 2009 has panache, drinkability and gregariousness. The 2009 is primarily Syrah (60%), with Grenache (30%) and Mourvedre (10)% as helpmates. At an average retail price of $15.99 per bottle, this is another nice find. By the way, the artwork on the label is a representation of some one of the cave paintings in Lascaux. Ripe, dense nose with blueberry, cherry, tar and dried herb hints. Full-bodied with moderate acidity and dry, well-integrated tannin – good balance. Peppery with black cherry and blackberry jam on the palate. Violets, rosemary and white pepper notes abound. Smooth and enticing. Moderate length – young. Drinking well now and should hold for another 2 to 3 years in the bottle. A good value. For generations of American wine drinkers, the term Chablis means insipid, slightly sweet white wine that comes from the Central Valley of California. As a wine educator, this is painful, but I can’t blame the wine drinking populace. No, I level the blame with the ATF, and now the TTB, the organizations responsible for promulgating the wine labeling requirements for wine in the US. Many years ago, in their infinite wisdom, the ATF decided to create a set of “generic terms” that could be used on wine labels to help “name” and “market” wines made in the US. Chablis is one such term and it is unfortunate, especially since the French have sought legal protection for most of their more famous AOC’s. 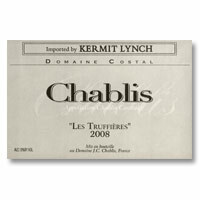 The Domaine Costal, another partnership involving Kermit Lynch is stunning Chablis. The other stunning factor is the price – average retail of $29.99 per bottle is a remarkable value. If you prefer your Chardonnay as an expression of the fruit and not winemaking techniques, then this is a wine for you! Green apple and mineral nose – clean with just a tiny hint of oak. Medium-bodied with moderate acidity – rich – well balanced. Tart, citrus palate with lemon, apple and pear notes. Long finish with a purity of fruit – delightful! Drinking well now and should improve with another 5 to 7 years in bottle. A good value in Chablis! Folks who have taken part in my Art of the Cocktail class are aware of my feelings about the Martini. In a word, my feelings borrow from the movie Highlander: “There can be only one!” Well, perhaps this is not entirely true. As a purest, I believe that the ONLY base spirit permitted in a Martini is GIN. Not Vodka, not Apple Schnapps, not anything but Gin. Given that, I will certainly entertain the multitude of variations that masquerade as Martinis, even if their name bears no reference or similarity to the original, welcome the Hoffman House, the Vesper and the Racquet Club Cocktail. However, the essential formula must contain elements of the original cocktail: Gin and Dry Vermouth. From there the palate is endless and can include additional spirits, different garnishes, a range of bitters and even neat versus on-the-rocks. Before I get to the subject at hand, I must digress to another aspect of this much bastardized cocktail – the concept of the “dry” martini. In its original form, the balance between Gin and Vermouth was more evenly matched. Heck, the original drink was likely created with a version of Gin that possessed a sweeter, more aromatic profile – Old Tom Gin. To me the perfect cocktail is about BALANCE – that quality wherein the individual flavors and tastes of the various component parts marry into a blissful concoction of smoothness and pleasure. The bar tenders of old knew this and were largely forced to become masters of mixology primarily as a result of sub-standard base spirits. Old pros knew that to keep the crowds coming in for more libations, the drinks needed to be spirituous and alluring. At some point the Martini took a turn towards manliness. Somehow, returning veterans from the last great conflict (that would be WWII for the very young among us) felt that slaking their thirst with glasses of chilled Gin was the most appropriate means to dull the painful memories of a war-weary nation. Vodka showed up with the Moscow Mule and the Screwdriver and it would seem that the concept of the balanced cocktail flew out the window forever. Adages like “pass the Vermouth over the Gin/Vodka,” or “turn towards France when you shake the Gin/Vodka with ice” became the hallmarks of a drinking nation. Fortunately we are seeing the errors of our ways. The recent resurgence in classic cocktail drinking is bringing back the concept of balanced libations. A perfect example is the previously mentioned Racquet Club Cocktail. In this month’s Imbibe magazine, Mr. David Wonderich writes about this wonderful pre-Twentieth Century treat. What drew me to the cocktail was not the 2-to-1 ratio of Gin to Dry Vermouth, but instead the addition of Crème de Cacao to the recipe. I found that when I crafted the cocktail with Old Tom Gin and a healthy bar spoon of C-d-C, it was remarkably smooth with just a whisper of dark chocolate on the finish. Ice cold, the drink was near perfect for taking the edge off a long day. If you like the Vesper, I heartily recommend that you roll a Racquet Club Cocktail and compare. Mix all ingredients and shake vigorously with crushed ice. Strain into a chilled cocktail glass and garnish with a lemon twist. In my History of Italy, France and Spain in Ten Glasses classes I talk about the important contributions that the Muslims made to the history of wine and spirits. For openers, the Muslim invaders brought with them the art and science of distillation, which they used for producing perfumes and medicinal elixirs. It took distillation in the hands of Christian monks to produce a different elixir, one known as the “water of life,” or Whisky. Muslims also brought with them a better understanding of astronomy and the impact of planetary motion on agriculture, which in turn improved the growing of crops, especially grapes. Lastly, the Muslims brought with them the vine – specifically vines of the Muscat grape. Despite the conflict that has raged between Christians, Jews and Muslims over the last 2,000+ years, I think we wine and spirits lovers should take a moment to say thanks. 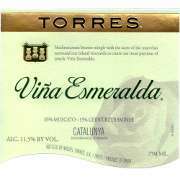 So I’m not waxing poet about world peace, but I am going to rave about a lovely wine from Spain – the 2010 Torres Viña Esmeralda, a terrific blend of Muscat (85%) and Gewurztraminer (15%), giving the wine an exceptionally exotic nose and palate. A “light” wine at 11.5% alcohol (I seem to recall when a “light” wine contained 5% – 7% alcohol), the forward fruit provides the teasing impression of sweetness, but the finish is crisp and food-friendly. At an average retail price of $13.99 per bottle, you really can’t go wrong. Perfumed, floral nose with honeysuckle, lychee and pear hints – gorgeous! Light-bodied with moderate acidity – crisp and clean – well balanced. Citrus and exotic fruit palate – lemon, apricot and papaya notes – smooth. Moderate length – light and refreshing. Drinking well – not for aging, although the screw cap will keep the wine fresh for a while. Perfect for the Thanksgiving table! Super Tuscan… Most people who have drunk wine long enough know the term… For those who don’t, the term was coined back in the late 70’s, early 80’s and it describes a particular type of wine from Italy’s Tuscany region – the home of one of the world’s most well – known wines – Chianti. So where does this term come from? Well, as I have related to so many of my classes, throughout the 60’s and early 70’s the wines of Chianti were universally considered some of the most awful wine on the planet. Rampant over planting and production, combined with less-than-stellar wine making combined to produce wine that was thin, bitter and just dreadful. Even pizza was embarrassed to have to share the limelight with this inferior plonk. 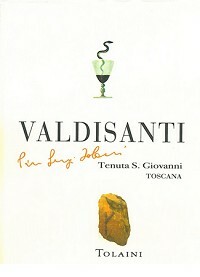 With time, younger wine makers, and a few traditionalists started a movement to make Chianti a wine worthy of its name. However, during this renaissance of wine, certain producers felt that the problem was more deeply-rooted – fundamentally the laws governing production in Chianti needed to be “updated” to harness the true potential of wine making in the region. Well, updating wine laws in Italy is tantamount to changing the laws of Roman Catholicism – I think it involves flying pigs, or a certain subterranean region freezing over… Get the picture? So, a few enterprising folks decided to make some wine that was truly the best wine they could make, literally “Super Tuscan” wine. Of course, the wine did not conform to wine law standards and therefore had to be delimited as plain old Vino da Tavola wine, but to wine connoisseurs around the globe, these were wines worth noticing. Ripe, jammy nose with blackberry, raspberry, lilac and tar hints – stunning. Full-bodied with moderate acidity and firm, dry tannin – good balance. Sour cherry palate with truffle, saddle and red berry notes – impressive. Long finish – smooth with layers of complexity – spice, cocoa and vanilla bean. Drinking well and should improve with 7 to 10 years in the bottle. Good value. Here’s to breaking the rules and producing the best wine possible! As far as grapes go, Pinot Gris has a pretty tough life… As Pinot Grigio, this grape has contributed to millions of gallons of insipid and watery Italian white wine that frankly has less character than the Aqua Minerale perched next to your order of Bruschetta. Thankfully this is changing and producers like Alois Lageder are proving that Pinto Grigio can make respectable wine. Across the Alps into France the grape fairs better, but is often beaten out by the competition – Pinot Blanc, Riesling and the ever exotic Gewurztraminer. The racy acidity that is often a hallmark of well-made Pinot Gris is underappreciated when put beside the alluring characters of its brethren. 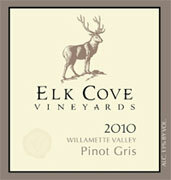 Domestically, Pinot Gris is often lost in a sea of buttery Chardonnay, competing like a plain-Jane wall flower at the High School prom against the likes of Pamela Anderson during her best Bay Watch years. Bright, lively nose with citrus, floral and mineral hints – lovely and seductive. Medium-bodied with racy acidity – crisp and clean – very well-balanced. Tart, mouthwatering with good mid-palate fruit – lemony with subtle pear and green apple notes. Moderate length with a pleasant, lingering finish. Drinking well now – not for aging, but the screw cap closure will ensure some longevity. At the Smart Wine Shopping event at Martignetti’s we tasted through a number of really nice wines, all positioned as high-value – meaning not necessarily cheap, but certainly worthy of spending your hard-earned wine dollars to acquire… One wine of note is a tasty little gem from Bordeaux, produced in the modest commune of Listrac-Médoc. Not as famous as some of the other communes along the left bank, Listrac-Médoc can produce, in great vintages, wines that deserve attention. The other nice aspect of Listrac-Médoc is that its modest stature means modest prices, usually. The 2009 Château Veyrin is virtually unknown, at least to me anyway, but I’m less about notoriety and more about what’s in the bottle. And there is quite a bit in this bottle. Plumy, chewy with nice structure make this wine a real winner, especially at an average retail of $17.99, pre-discount. Fresh cherry fruit nose with characteristic mineral, tobacco leaf and mint hints. Medium-to-full-bodied with moderate acidity and moderate tannin – good balance. Black currant palate with menthol and plum notes. Moderate length with a tight finish. Drinking well and should improve with another 3 to 5 years in the bottle. Super value in a stellar vintage.